So the man on the radio said potentially 20 inches of snow from the upcoming storm, and I don’t know about you, but my back is already starting to wimper. Every year when it snows, we get blindsided by how tough and strenuous shoveling and clearing snow can be. Every year my office fills up with people who tweak a muscle or aggravate an old injury and need an adjustment. No one is immune to an aching back and we have to do our best to prevent the pain. 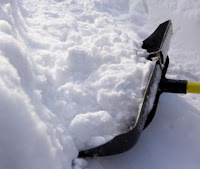 I’ll go over a few quick pointers for fewer injuries when you are hoisting mountains of snow off of your steps and around your car. And of course, if you need us, Living Well Medical in NYC is only a phone call away at 212-645-1495. First things first: Stretch! It might sound ridiculous since you aren’t “exercising” in the proper sense, but you are going to be engaging in some serious lifting. And frankly, if the forecasts are correct, it’s going to a lot of lifting, so it’s important to warm your muscles and joints up. Remember to lift with your legs, not with your back. One of the biggest mistakes people make is angling their torso when they go to pick up snow. Using the innate strength of the legs is much more biomechanically efficient and less likely to cause you an injury. Lift somewhat they way you would do a squat - plant your heels and push downwards to raise yourself up. Don’t wing it, move it. There is no need to chuck the snow over your shoulder - that only invites injury. Instead move the snow in as short a motion as possible and continue on. Take breaks when needed. In our rush to finish the job, we sometimes do more harm than good. If you start to tire or ache a little, take a break, get a hot drink, and let your body rest some. It’s a simple enough thing that gets overlooked. Stay warm! Make sure you are dressed properly. As with the stretching suggestion, warm muscles are happy muscles (when they are working hard), so give them what they need! Wear proper attire and don’t skimp on good gloves and boots. A nasty slip can be just as devastating and painful. Get a shovel that works with your height. This is also going to depend. Do you have back troubles? Buy a shovel that enables you to move the snow without much bending. Are you very tall? Buy a longer-handled one. Use common sense, but don’t assume that all shovels are equally good for the job. Mostly, listen to your body. If you get hurt, stop right away and get help. Living Well Medical in NYC is always there if you need relief. Call us! Is it a Pinched Nerve or Disc Pain?